【Ring Light Dimmable】- Dimmable 14"/35cm Outer 41W 5500K 168 Pieces LED bulbs with a wide dimming range from 1%-100%. Special LED SMD design, lightweight and portable. 【Ring Light with Stand】- The legs of stand can be folded up and fixed with a locking device easily. Lightweight for deposit and carry. 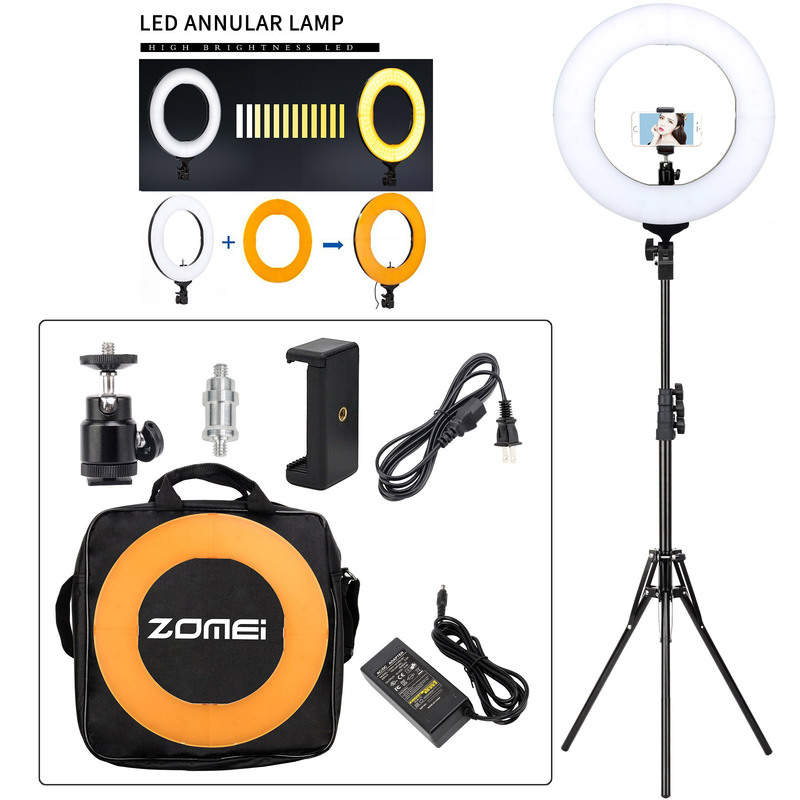 【Package Included】- 14 inch dimmable ring light kit including light, tripod head, carrying case, phone holder and additional diffuser. 【Multiple Purpose】- Widely applied to YouTube videos, makeup, Studio shoot, video blogging, portrait photography and live streaming etc. 【Environment Friendly】- No ultraviolet and infrared light radiation, low heat output, safety and environmental protection. 1. We ship within 1 business day once payment completed. 2. Import duties, taxes, and charges are not included in the item price or shipping cost. These charges are the buyer's responsibility. Please check with your country's customs office to determine what these additional costs will be prior to buying. We typically ship orders Monday through Sunday (except for Holidays) within 24 business hours of receipt of payment. All orders except for without registered fee are shipped with a Delivery Confirmation. You may combine multiple auctions into one order to save on shipping charges. Please do not checkout and make payment until you have completed all of your purchases. International Shipping & Handling charges are FREE to most countries, refer to the shipping and handling tab if you're country is free. We are a professional camera filter,tripod and other camera accessories manufacturer. We are keeping specializing in researching, developing and producing camera filters,tripod and also other camera accessories. We are mainly selling the Zomei® Product. Our goal is offer the best customer service. We guarantee refund money in 30 days, but the buyer need response for the shipping fees. We accept exchange defective products within 60 days of delivery date.